Well, the green socks are done. They turned out a little bigger than I planned. I knit the heel flap too long by 4 rows, meaning I picked up 21 stitches. I think 19 is a better number of pick-up stitches for a long heel flap. I wear out my socks where the heel meets the leg, so I thought a longer heel flap would be a good idea. It actually made the foot too big. 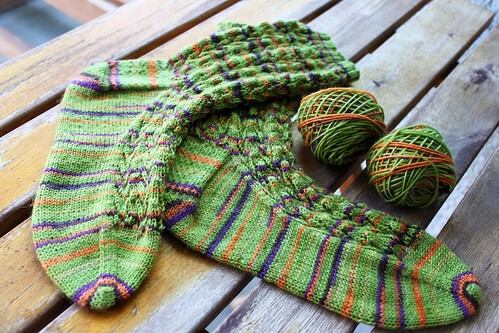 I want to try this stitch on another pair of socks and then will share a better pattern than I can write now. I do like the stitch. It is really stretchy. I had some trouble keeping the color stripes lined up. It doesn’t show too bad though. When I got to the toes I was about 20 stitches off. I had to knit one row twice on one sock to get the toes at the tips to match. I am thinking of calling these my Frog socks, not just because of the color, but all the times I had to rip-it, rip-it. There was quite a bit of yarn left over too, so next time I will knit taller legs. This entry was posted on Tuesday, May 26th, 2009 at 3:00 am and is filed under Knitting. Tagged: Knitting. You can feed this entry. You can leave a response, or trackback from your own site.